Stockton is a civil parish in the in the Stratford-on-Avon District of Warwickshire, England. The village is located just to the east of the A426 road around two miles north-east of Southam, and around eight miles south-west of Rugby. It is well situated with a host of towns and cities nearby: Banbury, Coventry, Daventry, Leamington Spa, Rugby, Southam & Warwick. The 64 bus runs through the village between Leamington Spa and Rugby, once an hour in each direction. There are roughly 600 properties [houses & businesses], and in the 2001 census it had a population of 1,391. Stockton's name was first recorded in 1272, the name meaning 'a fenced enclosure'. The village grew up mostly from the 19th century as an industrial village, housing workers for the local cement industry. There is an interesting book available about the history of the Griffins Cement Works at Stockton. Please visit www.littlebeams.co.uk for a download. The now closed Nelson Cement Works made cement from blue lias clay, which was quarried locally. Some of this cement was transported down to London and used in the construction of the Thames Embankment. Just to the north of the village is the Grand Union Canal, which served the cement works via a, now filled in, spur. Stockton was once served by the former Weedon to Leamington Spa railway line, and its station was called Stockon & Napton (referring to Napton-on-the-Hill which was about 1.5 miles away). The station was closed to passenger trains in September 1958 marking the end of the service to Leamington Spa Avenue and Warwick Milverton stations in one direction and Daventry, Weedon and Northampton in the other. It was closed to all trains along with the line in 1963. Built for double track, had the line survived it would have been a useful diversionary route around the present chaos at Rugby and for freight traffic heading to Birmingham as well as a facility for local passengers and cement works traffic to Rugby thus easing pressure on local congested roads. 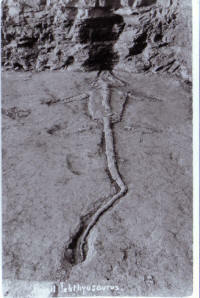 In 1898 a large fossil was found locally of an Ichthyosaurus. This extremely rare fossil was taken by the Natural History Museum in London who have it on display.